How would you like your company name to be seen by over 20,000 class A, B and C consumers with high purchasing power? 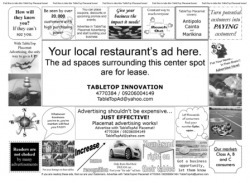 TableTop Innovation proudly invites you to an effective and inexpensive advertising opportunity. Your placemat message will be on the restaurant tables before a minimum of 20,000 readers throughout the monthly duration, putting you directly in front of your customers every minute of everyday! Your placemat message will impact your audience for up to 40 minutes unlike flyers and brochures that are thrown away, classified ads paper and posters that are left unnoticed. Restaurant goers can then take the placemats home for even wider readership. A restaurants' natural, warm environment is the perfect place to reach out to consumers who have disposable income. They will remember the dining experience & they will remember your message! If you want to make a lasting impression on your target audience, the specialty placemat is your best advertising alternative. So what are you waiting for? Reserve your ad space now! Contact us at 477.0384 / 0920.600.4149 / TableTopAd@yahoo.com, kindly look for Bernard or Emyl.